Long ago, gardeners need animals, such as oxen, to pull their tillers, so they could break up the soil in preparation for planting seeds. Luckily, technology has served us well and made the process much easier. When you decide you want a garden, a rototiller may be one of the first large purchases you make. There are many factors to consider before you make your selection of the best rototiller for your needs. The right rototiller can drastically reduce the physical toll of beginning a new garden. However, you want to make sure you pick the right one. Rototillers come in three styles: front-tine, mini-tillers, and rear-tines. Let’s look at the difference and factors to consider. These aren’t meant for the heavy-duty work. They are similar to cultivators and are best for mixing up soil in established beds. However, front-tine tillers are more powerful than your typical cultivator. The tines are responsible for the propulsion, so they can be difficult to push at times. If you have some hard soil to break up, a rear-tine is the way to go. They come with rugged tires and can work in most conditions. Rear-tine can break through clay soils. If you are turning a patch of your lawn into a garden, this is the type of tiller you will need. Rear-Tine tillers have a separate drive system, so they are much easier to propel through the garden. These are also referred to as cultivators. They can hard some tough jobs, but aren’t nearly as powerful the previously mentioned varieties. They have front-tines, which till and pull the unit forward. ​For small jobs, an electric tiller would be a great selection. They are quiet, dependable and powerful enough for smaller jobs. You have to stay close enough to an electrical outlet. They come in different sizes, with the largest electric tillers running on around 10 amps. 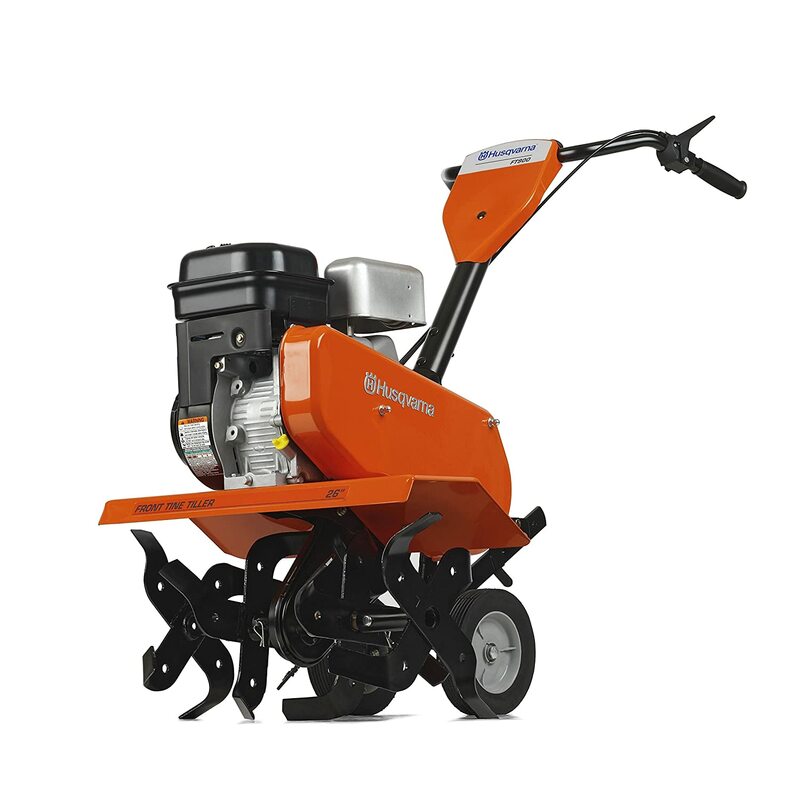 ​Gas powered tillers come in a huge assortment of sizes and styles. There is something for every gardener. This is the way to go for larger projects or if you want to have more power. They are the most powerful garden tillers available on the market. However, they can be very loud and not as environmentally friendly. The first thing you need to look at is the size of your garden. This is going to determine how much power you need for your rototiller. If your garden is less than 1,500 square feet, a mini-tiller should perform the job perfectly. If your garden is in between 1,500 and 5,000 square feet, you should look for a 5 to 6 horsepower tiller. For gardens that are larger than 5,000 square feet, the engine should be at least 6 horsepower. ​Another consideration is the type of soil you have. Very dense or rocky soil can be difficult for smaller rototillers. If the rototiller isn’t strong enough to break through, it will just skip over it. Look at your garden soil, and consider moving up to a stronger horsepower tiller if this is your soil type. It is the blade that churns through the soil. The tines are going to get the soil all ready for you to plant your garden. They are one of the most important parts of the rototiller. An ideal rototiller tines will be made from heavy duty steel with different cutting surfaces, so it can cut through a variety of weeds and roots. There are a few variations. Counter-Rotating Tines: These move in the opposite direction of the rototiller. They dig in the deepest and are ideal for breaking new ground or working through tough, clay soil. Forward-Rotating Tines: Just as the name suggestions, these tines more in a forward direction just like the tiller. They are typically found on front-tine tillers. There are three types of blades that come with rototillers: Bolo, for deep tilling, Slasher, for thicker weeds and roots, and a pick and chisel, for rocky ground. ​When you make the selection, think about the project you are going to use it for. Are you going to break new ground for a large, brand new garden? Or, are you primarily going to be using it for existing garden areas? This is going to determine the amount of power you need in your rototiller. ​The most ideal garden tiller will have an adjustable depth and width. 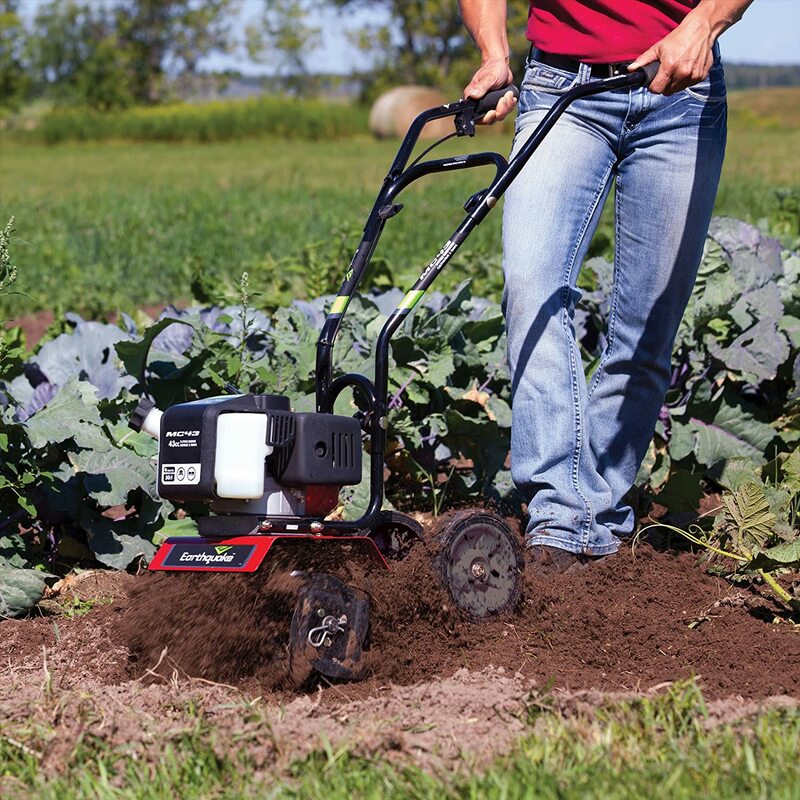 For breaking new ground, you want a tiller that can reach 8 to 10 inches. This is especially important if you want to plant root vegetables, such as carrots and turnips. Make sure to check this before purchase. Earthwise has created one of the best-selling rototillers on Amazon today. It is an electric, 8.5 amp tiller. It has dual 4 blade steel tines and moves fairly fast. The Earthwise tiller can cut to a depth of 8.5 inches and a width of 11 inches. This tiller would be perfect for raised beds or along a fence line. It wouldn’t serve you well to break in a new garden bed. For those who are earth friendly, this rototiller has zero emissions. The weight of this rototiller is not overwhelming; it only weighs 26lbs. It can only move forward, but it is strong enough to power through a multitude of soil types. The Earthwise rototiller is very friendly on the budget. Are you looking for a stronger rototiller that can do nearly any job? Husqvarna has you covered. Their products are known for their superior quality and durability. The power behind their machines are typically unmatched. This garden tiller features a 208cc Briggs and Stratton engine. It will be able to go through most soil conditions. However, it is not the tiller to purchase if you plan to break new ground. The width of the tines can be adjusted from 12, 24 and 36. This gives you a lot customizable options. Another feature for this tiller is it can go in reverse. These tillers can be referred to as “self-cleaning” because it will flip off the dirt when put into the opposite direction. The depth can be adjusted with the depth bar, attached to the back of the rototiller. This bar is also called a drag bar, because it is pulled along behind the tiller. Many people think rear-tine tillers are the best, but this front-tine tiller has great maneuverability around areas. Given the amount of power and size of this rototiller. This can be quite a chunk of change for some people. However, Husqvarna made the assembly as easily as they could. With the size of the tiller, you can till a garden over 5,000 feet, so long as it is previously worked ground. 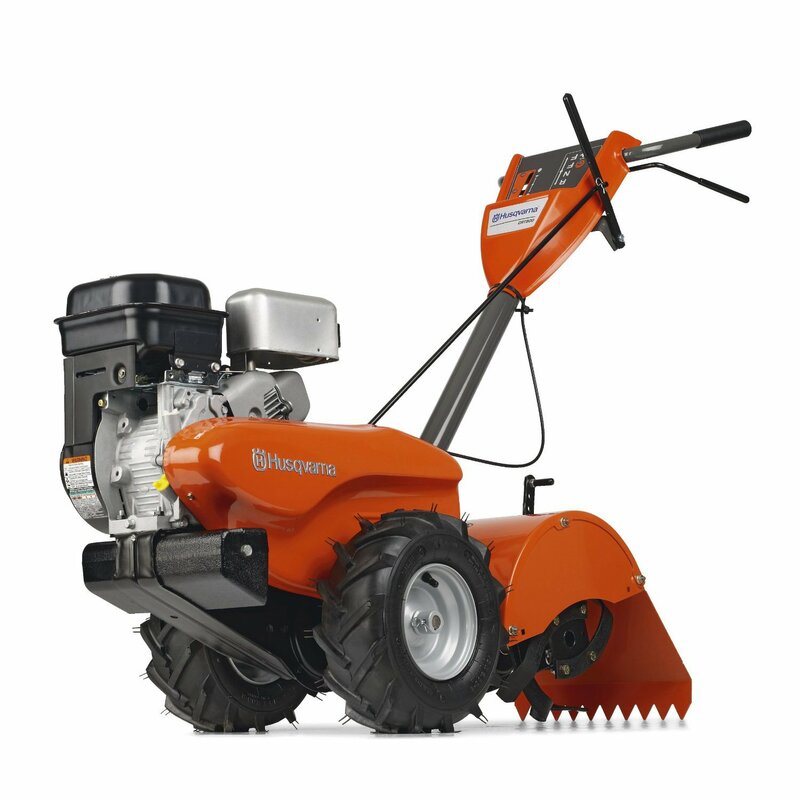 Husqvarna created the heavy-duty rear-tine rototiller that those with large gardens are going to want. 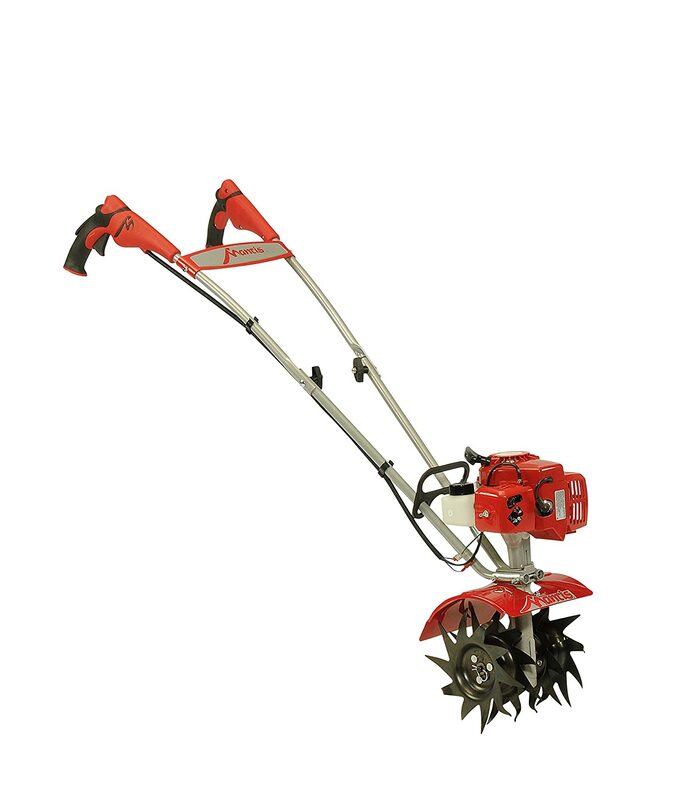 It is a professional grade rototiller, with counter-rotating tines. The speed of the tines is high, making even the toughest job easier. The engine in this Husqvarna is tough. It is a 4-cycle engine and doesn’t review the mixing of oil and gasoline. 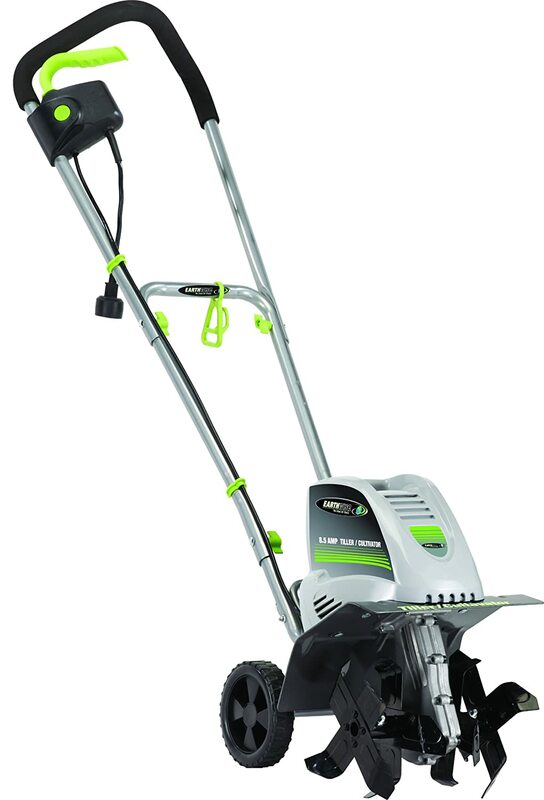 It is a workhorse, built by Briggs and Stratton. The quality here is impeccable. This is the rototiller you need if you want to break new ground. You can work for hours with this tiller, and it would never stop working. You aren’t going to encounter much that this rototiller can’t handle. It will churn through roots and rocks like it is nothing. However, it can be a bit difficult to get into gear at times. With some practice, you will start it easily. There is a rear tilling plow to help level out the soil as you till it up. It can also go in reverse, which kicks out any dirt that may clog up the machine. One of the first noticeably features on the Mantis tiller is the 4-cycle engine. Most people prefer not to have to mix oil and gas together; the 4-cycle engines take normal gasoline. Another enjoyable feature is the weight of the tiller. It only weighs 24lbs, making it easy to transport. Even though the Mantis is lightweight, it still features a powerful, 25cc Honda engine. It can power through compressed soil and sod. The startup is designed to be easier, plus it has a finger controlled throttle with speed control. You can power it up for harder soil and pull back the power for easier jobs. Comfort is a factor to consider in your purchase. The tiller has soft grip handles, so your hands and wrists won’t suffer. It comes with a 5 year consumer warranty to comfort your mind. The engine is covered for 5 years, but the tines are guaranteed for life against breakage! The width and depth are not as impressive as one would hope. This tiller is meant for compact jobs. The width is 9 inches, and the depth can till down to 10 inches. However, the tines can be turned to a shallow depth of 2 to 3 inches. For a pre-tilled garden bed, you won’t find a better rototiller than the Earthquake MC43. It is small and lightweight, weighing only 33lbs, with great maneuverability. This is a great choice to move around garden rows. Unlike other options, the MC43 isn’t known to jump as much while working soil. Despite the small size, the Earthquake has a 43cc Viper engine, providing a great amount of power. It is a 2-cycle engine, so you will have to mix oil and gas together for the right mixture. Like most front-tine tillers, you can only move forward with this machine. However, it is self-propelled and helps ease your arm muscles. Given the price tag, you get a great machine. It is powerful and reliable, plus easy to assemble which everyone loves. These are just a few of the amazing rototillers available on the market today. Each of these rototillers are different in their own ways. We have the amazing, Earthwise tiller that is electric. If you want a rototiller for your smaller projects, this is a great option. Considering it is electric, it packs a strong punch. 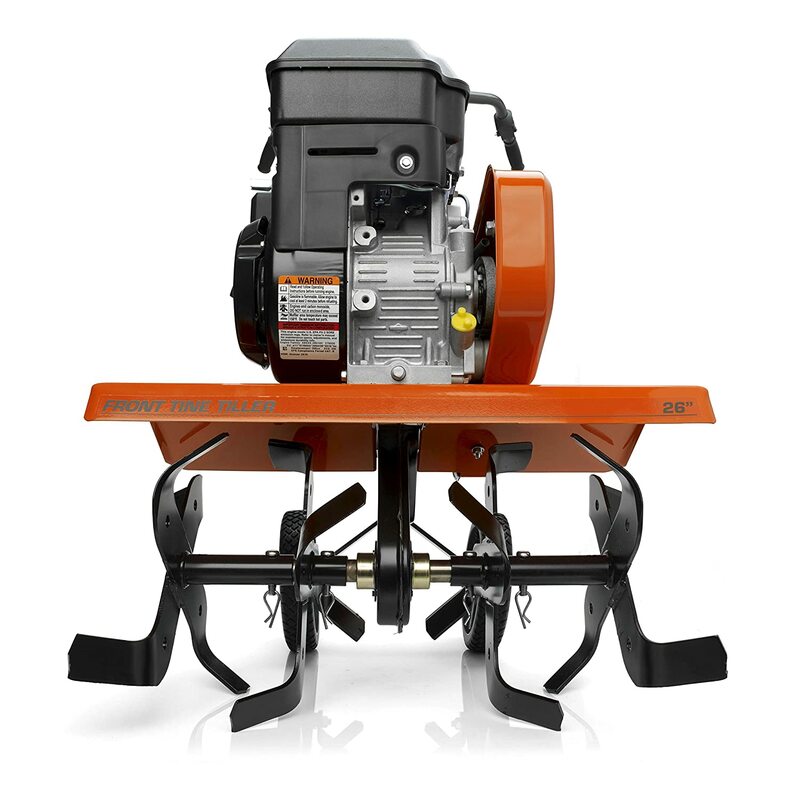 Husqvarna has created two powerhorse rototillers. Both the FT900 and CRT900L have powerful engines built by Briggs and Stratton. The Husqvarna CRT900L should be your choice if you want to break new ground, especially for a large square foot garden. If you are looking for a mini rototiller, the Mantis tiller has a strong, Honda engine, able to power through most soil conditions. It is designed with comfort in mind. The Earthquake tiller is small, but strong. The Viper engine is perfect for tilling up your raised beds, and it has the ability to maneuver wherever you need it to be. All of these rototillers are different in their own ways, but they all have their top quality in common. Is there a rototiller we missed that deserves recognition? We would love to hear about it in the comments!